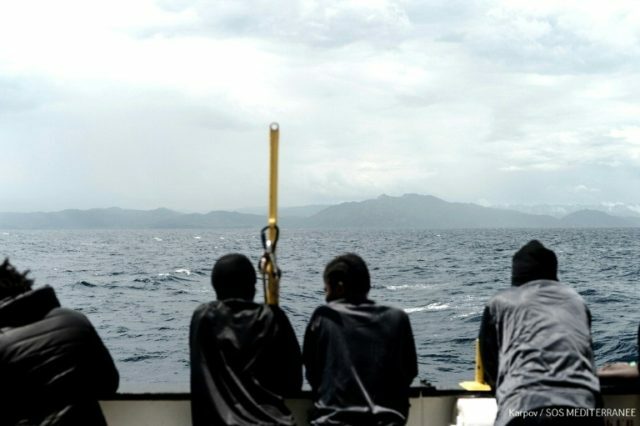 Brussels (AFP) – The EU is considering setting up “disembarkation platforms” outside the bloc to process migrants, according to draft summit conclusions seen Tuesday by AFP, as Brussels tries to solve a political crisis over immigration. European Union leaders meeting in Brussels next week will be asked to approve the creation of centres to assess migrants trying to reach the bloc and decide which are refugees in need of protection and which are economic migrants who should be returned to their home countries. Immigration looks set to dominate the June 28 and 29 gathering, after Italy’s new rightwing government refused to accept a boatload of migrants rescued from the Mediterranean and hardliners in German Chancellor Angela Merkel’s coalition gave her an ultimatum to get tough on the issue. “The European Council supports the development of the concept of regional disembarkation platforms in close cooperation with UNHCR and IOM,” the draft conclusions seen by AFP say, referring to the United Nations refugee agency and the International Organisation for Migration. The conclusions were drawn up by European Council President Donald Tusk in cooperation with Bulgaria, which holds the rotating EU presidency, and European Commission President Jean-Claude Juncker and would need unanimous approval by all 28 member states. The proposal, which may be revised before going before leaders at the summit, does not specify what form the processing centres would take or where they would be located, but an EU official indicated they would be set up in countries outside the bloc. EU states have been deadlocked for two years in efforts to reform asylum rules which currently require the countries where migrants first arrive in the bloc to process their asylum requests. Italy, Greece and Spain are the main entry points to Europe for the influx of migrants fleeing war and poverty in sub-Saharan Africa and the Middle East, and Rome’s hardline new government has taken a tough stance, saying it will not become “Europe’s refugee camp”. EU cooperation deals with Turkey and Libya, the main transit countries, have helped to slow, at least for now, the flow of migrants to Europe since the peak of the crisis in 2015. Leaders will also be asked next week to approve stepping up support for the Libyan coastguard, according to the conclusions. Last week’s row over the fate of more than 600 migrants on the Aquarius rescue boat has thrust the migrant issue back to the top of the EU agenda. Italy refused to let the vessel dock at its ports, prompting French President Emmanuel Macron to accuse Rome of “cynicism and irresponsibility”.